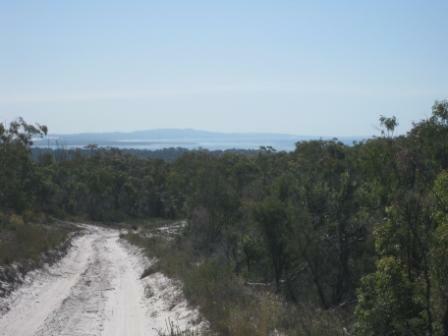 Stradbroke Island is an iconic destination that permits beach driving. 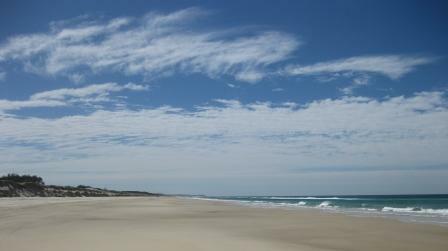 When we stayed at Straddie we drove on Flinders Beach and Main Beach, as well as driving the sandy Tripod Track. You will need a beach access permit from Redland City Council to drive on the beaches. The beach access permit is valid for 12 months and can be purchased from the Big Red Cat, Stradbroke Ferries, any of the Straddie Holiday Parks, the Amity General Store, Dunwich Sports & Hobbies, Dunwich News, Point Lookout Newsagency and Redlands on Moreton Bay Visitor Information Centre. A permit is not required to drive the Tripod Track. You will also probably want to carry extra water and a first aid kit, just in case. A tide chart is a good idea too because the beach is closed one hour either side of high tide to prevent people from driving on the sand dunes. Before you head off road, take the time to lower the air pressure in your tyres. I ran my Toyota Prado tyres at 24 psi (down from 36 psi), but many people were running at around 18 psi. I did not have any problems. 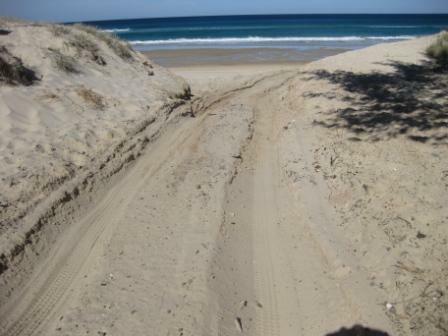 If you are new to four wheel driving on the beach, then Flinders Beach is a great place to start. The entries and exits from beaches are always the trickiest because they get churned up by many four wheel drive vehicles. At the time we were there, the beach access points to Flinders Beach were easy. There were a couple of small creeks crossing Flinders Beach. While they were only a couple of inches deep, in some places they had washed a channel with sides about 30 cm high. If you hit these at speed, it’s not going to be pretty. We easily drove around them though. 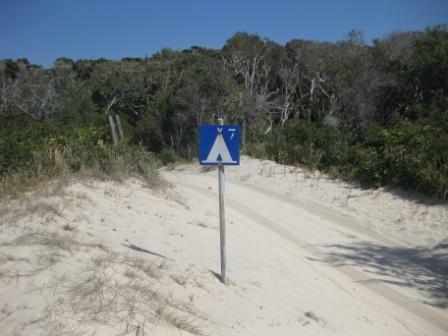 Camping is permitted in some designated camp sites along Flinders Beach. The access point at the end of George Nothling Drive is the main access point to the beach. When we arrived to enter the beach, a tractor was pulling a Ford Courier 4×4 up the track. It seems that the Ford Courier was broken though because it had been left at the top of the track when we got back. The access point had been churned up and the tyre tracks were deep enough that I scrapped my Prado’s underbody as we went down onto the beach. Main Beach is beautiful and much longer than Flinders Beach. We drove a couple of kilometres past the causeway access point before turning around. There were three large groups of people beach fishing — 10 to 20 cars in each group. The access point at the causeway was powdery and it was obvious that no vehicles had been up there for some time. A Park Ranger took two goes to get up the access point, so we did not give it a go. 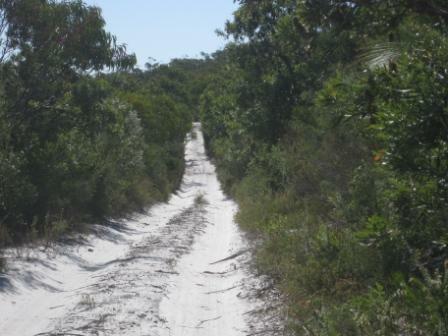 Tripod Track, while not a beach, is a sandy four wheel drive track between the Trans Island Road and the East Coast Road intersection to Amity Point. The access points are not signposted. The northern access point is on the East Coast Road and is about 200 metres west of the intersection between the East Coast Road and Beehive Road. The southern access point is on the Trans Island Road between the Blue Lake National Park entrance and the causeway. We found it by guessing that the large number of tyre tracks off the road led to the Tripod Track. The main entrance is up a sandy hill, which the Prado easily navigated. The Tripod Track is mostly single lane, with several blind corners. Take it easy and you will not have a problem. The sand and wheel tracks were not deep through most of the track. Again, this is a pretty easy track to start your four wheel driving. To read more articles about our holiday on Stradbroke Island, please browse the Stradbroke Island tag. 10 Days to Successful Options Trading Home Study Program + free boonus Bet Stock just best like you say! Think, don’t go down onto the beach in the same tyre track if a vechile is coming off the beach, especially going onto main beach. Found the 4wdriving disappointing. Every track closed except tripod track. Could not get access to the keyholes which I did not know until we got here. Beaches were not a challenge and saw many all wheel drives do it easy. Quite honestly I could have got a HQ Holden on and off the beach. Camping was a good experience but won’t be back in a hurry. Public holiday Monday few shops shut. Guys you can do it better. Here at the moment and yes it’s disappointing that all the fun stuff is blocked off. Only good thing I found was the huge hill climb off the main road between The Brown and Blue lakes. It looked very challenging but as I was alone I didn’t really give it a go. Next time with another vehicle as backup. Hey Justin, appreciate the info, we’re heading over this weekend & can’t track any info on closures. Do you know if the blue & brown lakes are open/able to be accessed? Any other info on what’s accessible? Brisbane council needs to update and educate about 4×4 tracks on Straddie. He keyholes closed 2 years ago because someone is suing council for neck injury so the rest of us have to suffer….mining company owns the other access and like all mining companies they don’t support the local community whatsoever.